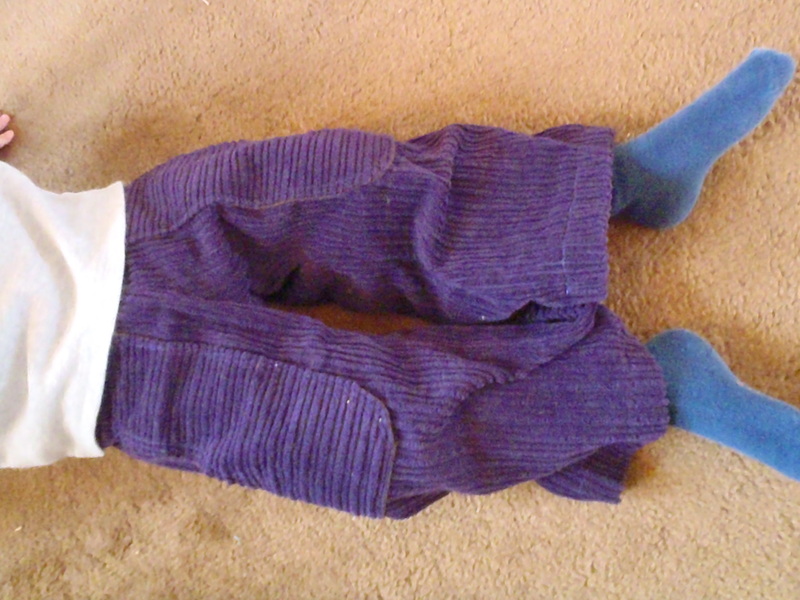 I mentioned in my previous post that I made H a pair of purple corduroy pants for Christmas and I promised that I’d post some pictures. I used the same pattern that I’d used for the kids’ Robin Hood Halloween costumes, except this time I made it a Flat-Front pant rather than put the elastic all the way around. Dana from Dana-Made-It.com suggested that flat fronted pants were better if you wanted to put pockets on the pants, which I did. 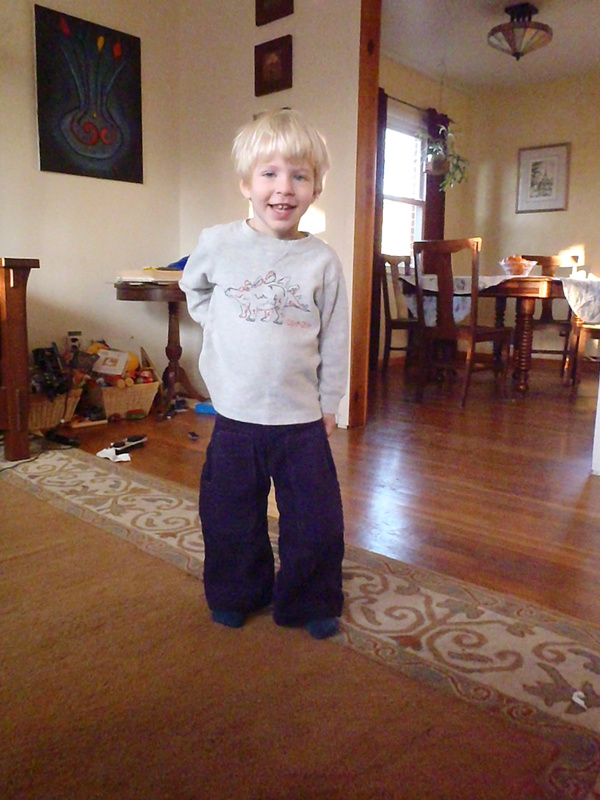 Purple Pants and a happy boy!! I made them a little lose fitting in the legs so his boots would fit underneath and he’d be able to get them on and off by himself easily. The pattern can be slimmed down for a closer fit without a problem. You can see the elastic in the waist at the back. 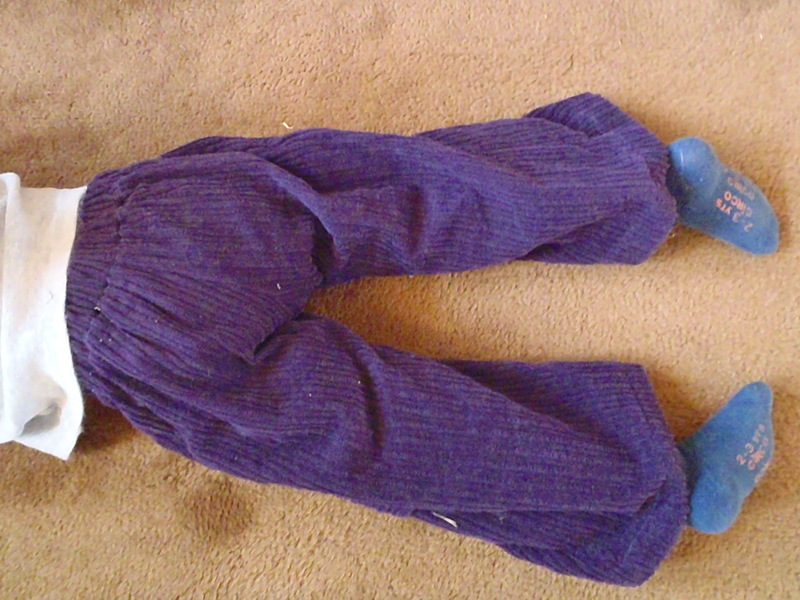 Incidentally, flat fronts are also good for when you don’t have enough elastic to go completely around you kid’s waist. Not that that’s happened to me. Pockets just right for cramming rocks and toys. I applied the pockets with the stripe of the corduroy going perpendicular to the direction of the corduroy stripe on the pants. I think it looks awesome. Frankly, I can’t wait to make more. Maybe I’ll make both of them some seersucker pants or shorts for the summer!